Questore Alessandro Cenni with the state police is assigned to investigate the murder of a German former diplomat who had been living in the village of Paradiso in Umbria. The body of Jarvinia Baudler was horrifically mutilated. The Germans seem more interested in obtaining World War II documents they believed Baudler had in her possession than they seem about catching her murderer. In fact, they want nothing more than for the crime to be wrapped up as quickly as possible. The victim herself was not well liked. The list of suspects who would benefit from her death is long. Cenni's investigation takes him back into the past at a time when Italy was occupied and allied with Germany as well as into the many relationships Baudler had, both with women and men. While the novel takes place mostly in Umbria, the reader is taken across Italy to Rome and Venice, getting a small taste of the people and culture as well as the country's politics. Although set in the present day, the novel touches on events that took place in Venice during the Second World War. While Italy was an ally to Germany during the war, there were those who resisted. There were also those who sought to bring down the Allied Forces, particularly England. And what better way to strike than at the economy? Despite pressure from the Germans and his superiors to make an arrest, Cenni is determined to get to the truth no matter the outcome. With help from his colleagues, his brother the bishop and good investigative skills, Cenni just might find what he's looking for. There is an overreaching story arch in the series involving the kidnapping of a woman Alex Cenni loved twenty years before who had never been seen again. Cenni believes he spots her while in Venice and the main story line takes a slight detour as he attempts to track her down. I found this to be a bit off-putting. It does serve to offer another side to Cenni, however, so in that way worked more fully develop his character. There are a number of characters, many of them quite eccentric, each with their own dark secrets to bear. The murder victim herself has quite a colorful past, and not one anyone would envy. She was a master at manipulation and uncovering secrets, then using those secrets for personal gain. She had made quite a few enemies over the years, including those in her inner circle. Alex Cenni is cynical and a maverick. He does not always follow the rules but he just about always solves his cases, even if it means arresting someone of high profile and earning the ire of his superiors. Even as he gets closer to learning who killed Baudler, Cenni begins to question the reasons he went into law enforcement and wonders if it is time to move on. Assisting him on the case is Elena Ottaviani, a friend as well as a colleague. She is firm in her stance for equality between men and women and does not take kindly to stereotypes. She's very capable in her job and deserves a lot of credit for putting up with Alex Cenni's occasional mood swings. She also is not afraid to point out when she believes he is out of line. 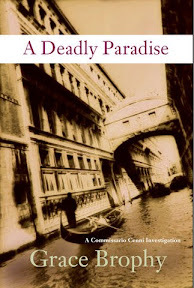 Grace Brophy's crime novel, A Deadly Paradise, is the second in a series featuring Alessandro Cenni. It is full of complex and interesting characters. The novel is a carefully crafted mystery that had me guessing for a good portion of the novel. Now to track down the first book in the series and read it! You can learn more about Grace Brophy and her books on the author's website. Great review! This sounds just the sort of book I would enjoy. I think I will look for the first book in the series too. Sounds good - Cenni sounds like a character I would really like. I like protagonists that are multi-dimensional. The plot sounds a tad complicated, but as long as you can follow it easily enough, that wouldn't stop me. Another series! It is amazing I get anything else read with all of the great series! Eccentric characters...WWII...I'm there! I actually have this book but haven't read it yet. Now I must dig it out! Glad to know that I don't have to read the first book in the series to enjoy this one. I hope it's okay for me to link to your review on War Through the Generations. I feel like more and more now, mystery novels are becoming a series of books and I am just not ready for that! Such a commitment :-) I do love how people are using the mystery genre to explore historical periods and make commentary on events/societal norms that took place. You may be interested to know that I heard about a FANTASY mystery series recently! I believe the author's name is Alex Bledsoe- I think one of us, at least, should look into him! Great review! Crime novels aren't always my favorite but I've read a few I've really enjoyed. This one sounds quite good. Yet another series though. lol. Now that I know that I am, in fact, a mystery fan, I'll be keeping an eye out for this series for sure :P I love mysteries when they're character-oriented especially (same as with any other books, unsurprisingly), so I'm happy to hear that's the case here. Sounds like a good read but I would have to start with #1!!!! LOL!! I'm not familiar with this author, but this one sounds good, so I'll be looking for it. I think I'll have to look for the first one, too, though. Another series worth following! Thanks for highlighting and reviewing this book, Wendy! Oh, yeah, I can see myself reading this book. My next download, I'm thinking! Sounds like Soho Crime created another winner - and setting it in Italy doesn't hurt either. Thank you for the head's up, Wendy! Donna (Myckyee) - I have a couple of mystery series set in Italy that I would like to read. I'm glad I was able to start with this one. Aarti - Haha! There are quite a few series out there and new authors are adding to them every day. And think of all the ones we have yet to discover! I am still discovering all the great historical mysteries out there. I can't get enough of them. I'll definitely check out Bledsoe. Thank you for the heads up! Dar - Yes, another series. LOL I haven't been reading as many as I used to. Sometimes I miss that. Nymeth - I'm so glad you've discovered the joys of reading mysteries. :-) I think quite a few crime fiction authors are writing character-oriented novels these days. There's nothing to say a good mystery cannot have both a great plot and well-developed characters. Staci - I prefer to start at the beginning of the series myself, but it doesn't always work out that way. I always feel a little guilty when I'm not able to. Danielle - This was the first I'd heard of this author too. I look forward to reading the first book in the series. Linda - I hope you enjoy it if you read it! sounds like an interesting book. Thanks for the review. by the way, just discovered that the copyright stuff is now showing up in my new posts...but not the older posts. Weird! you'd think they could make it retroactive.